Marin Mosaics is a boutique mosaic studio specializing in custom mosaics for walls, floors, kitchen backsplashes, and stair risers. Carol made her first mosaic, a flower pot, in 2002. She was hooked ever since. 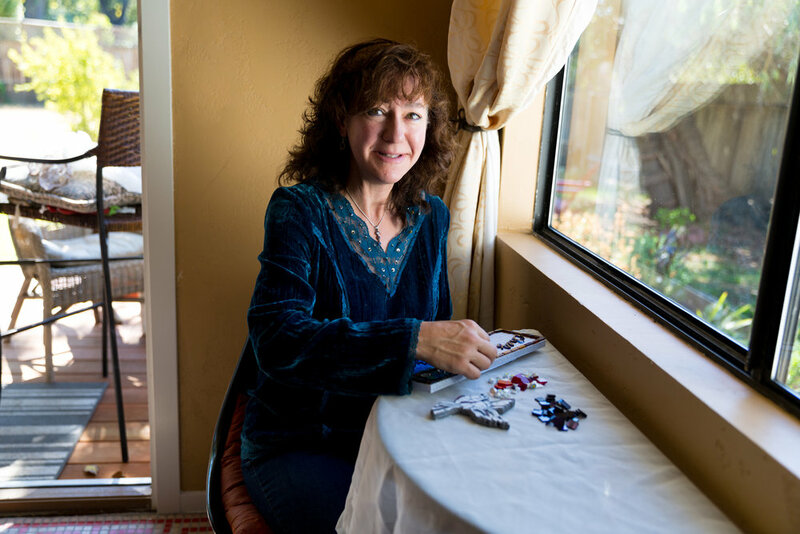 She crafts her custom mosaics from hand cut pieces of vitreous, stained, or fused glass using the same methods that have been employed by mosaic artists since antiquity. Carol works exclusively with glass because the refraction and reflection of light lend the mosaic a liveliness that other materials lack. She particularly enjoys doing large-scale installations, such as walls and floors, because the art becomes part of the structure of the building. She fell in love with the art of mosaic on a family vacation to Florida in 1972. Her family stayed at a 1950s motor inn on the beach near St. Petersburg where they swam in a pool with a mosaic of a red and orange Thunderbird on the bottom. The beautiful quality of light and fog in the San Francisco Bay Area inspires Carol, as well as the vast amount of nature she can see from her window-lined studio. You can often find her working outside on her deck, listening to an Ultra Lounge album, while her rescue dog, Odin, guards the yard from squirrels. Carol holds a BA in Fine Art and an MA in Art History from Michigan State University (Go Spartans!). She has a beer can collection and a Mad Magazine collection, both from the 1970s. Her favorite artist is John Singer Sargent. If she wasn't a mosaic artist, she'd be a pastry chef. Her dream vacation is to return to Lisbon. She paints velvet Elvis paintings. After a day of creating mosaics, you'll find her soaking in her hot tub while sipping a mimosa.